and the last name has been read. The Smiths, Patels, Thompsons, Chus, Garcias, and Simons have been remembered in the dust that blows around the site that once marked our efforts at world trade. Many brought flowers to this site. 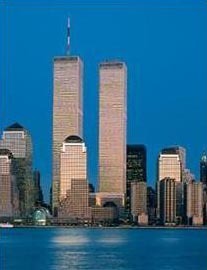 One year ago, I wrote a short post to this list about the Trade Towers tragedy of September 11, 2001. I wrote about a dove that perished in my balcony windowbox. I planted some flowers on the grave of this dove. There is a tiny, tiny church next to the site of this tragedy. This church was built in 1776. This rumpled and crumpled church survived the attack. This church was the real target of the terror because it symbolizes the birth of an idea -- the idea of separation of church and state. An idea that we - in the U.S.- take for granted. They name roses after famous people. Perhaps as a memorial, a garden could be planted next to the church with flowers named after the 3000 persons who died - a Smith hydrangea, a Patel lily, a Thompson bluebonnet, a Chu tulip, a Garcia sunflower, and a Simon mum. And the question remains: What did these people die for? Usurpation of unwarranted power by either the executive or legislative branches. Machinations of ignorant and superstitious agitators. Stalemate of the dominance of mediocrity. Control by ambitious and clever would-be dictators. Taxation enslavement of the citizenry by the state. Failure of social and economic fairness. Union of church and state.